Well here it is, the result of three day's work. 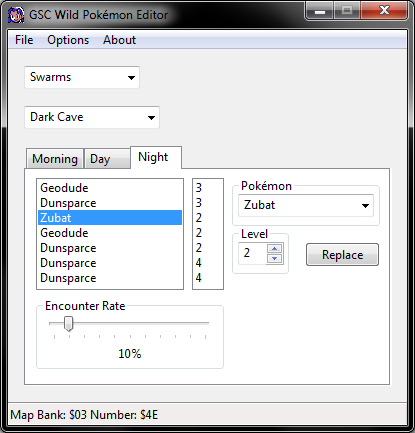 This program allows you to easily edit the wild Pokemon encountered by the player. 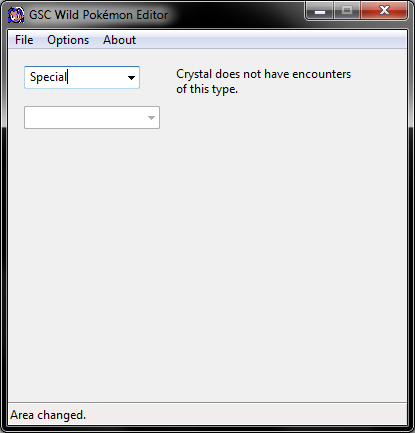 It edits grass encounters, surfing encounters, swarms, and special encounters in Gold, Silver, and Crystal. Thanks for posting! I'll give this a go in the morning. Looks pretty legit though. Good work! 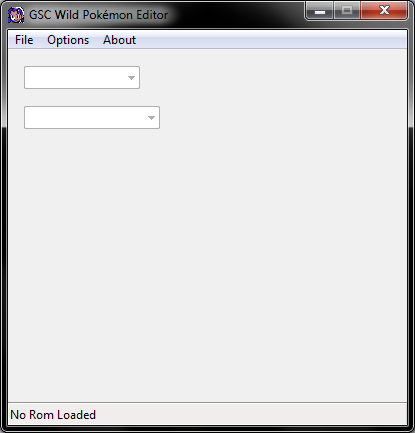 I could open pokemon gold with that program but it didn't support crystal. Unable to open file "C:/.../Crystal.GBC". If I click OK, it won't open the rom and if I click Cancel, it works the same way as Exit. Odd, I used Crystal for the screenshots. 2. Do you get the same error with a lowercase extension? 3. If you put the ROM in the same folder as the program, does it work? Which reminds me, if the ROM is read-only, you'll get a crash when you try to save. Going to find out if there's a way to tell if it's read-only or not. 2. Have no idea what "lowercase extension" means. Where do you have the rom located normally? In the folder, go to Tools/Folder Options. Then click over to the "View" tab and uncheck the box for "Hide extensions for known file types." I figured out how to make it to work. There was a letter in that folder that doesn't belong to english alphabet and the rom was inside it. After I changed the name of that folder, the editor was able to locate the rom. no problem sheck. Glad its workin for ya. Hey miksy, could you give me a few characters that cause the error? I think it's possible to make it work with them from what I just read, and I'd like to just in case. Nevermind, figured it out. Expect a fixed release tonight. Read-only files will not be opened, and an error dialog will be shown. If someone wants to be awesome and find out at what map does it stop matching up correctly, I'd be greatly obliged. Just read the info from the rom and be done with it. Reproducing stuff by hand is not fun. 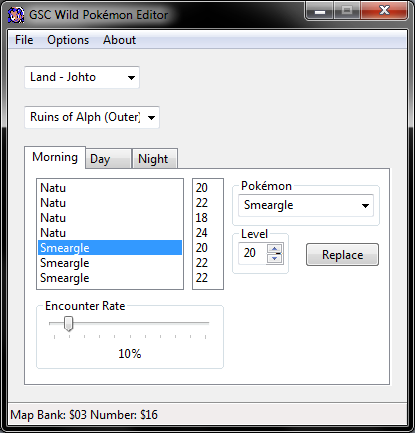 Maybe even cut map names and just make it selectable by map bank and map number. 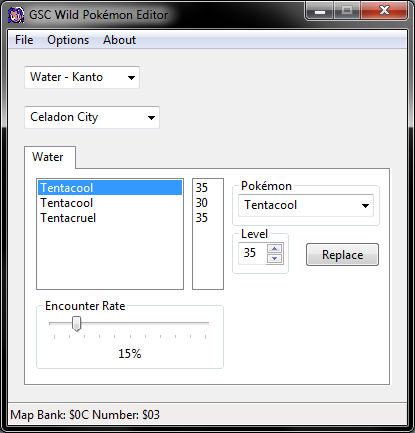 That would alctually be quite handy, and would make it easier to make it so you can re-assign wild pokemon data to a new map. Could read it directly from the rom like Goldmap does, though that'd result in all the indoor maps and all also being listed in the dropdown box. It'd be good though if someone did a massive hack though, as it'd work on every map. If I do that, I'll probably make the options "Land, Water, Swarms, Special". Swarms and Special would be static lists like they are now, Land and Water would be loaded from ROM. Sound good? That sounds like a good way to handle it. Just don't display maps without Pokémon. If somebody wishes to add one or swap places, he will be required to input the correct map bank and map number anyway. That way it's neat and tidy. I just tested this tool by editing the water pokemon of Olivine City. But it doesn't seem to work as I believe it edits data elsewhere. Are you sure the offset are correct for crystal ? Crystal is messed because it has a different order of maps.